흰등마멋(Marmota caligata)은 다람쥐과에 속하는 설치류의 일종이다. 북아메리카 북서부 산악 지대에서 서식하는 마멋이다. 풀과 잎이 큰 잡초가 자라는 경사면과 바위 지역의 삼림한계선 근처에서 서식한다. ↑ “Marmota caligata”. 《멸종 위기 종의 IUCN 적색 목록. 2008판》 (영어). 국제 자연 보전 연맹. 2008. 2009년 1월 6일에 확인함. ↑ IUCN (International Union for Conservation of Nature) 2008. 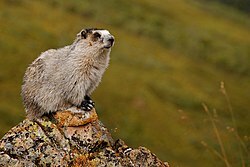 Marmota caligata. In: IUCN 2014. The IUCN Red List of Threatened Species. Version 2014.3. http://www.iucnredlist.org Archived 2014-06-27 - 웨이백 머신.. Downloaded on 25 February 2015.